Taos County Crime Stoppers (TCCS) relies on cooperation between the public, police and private sector to provide a flow of information about crime and criminals. The 3 reporting methods described below are designed to protect the anonymity of the caller. Tips are received by our call center located in Canada when a tipster dials our tip line, 575-758-HALT (4258). The call does not display a caller ID and conversations are not recorded. Depending on call volume at the center, tipsters may experience long hold times. If this occurs, consider using the P3 Tips mobile app or submit an online WebTip. The TCCS coordinator receiving the information from the call center reviews the tip and passes the information to the investigating officer. The caller will be instructed on how to follow-up on their tip or provide additional information at a later time. Our tip line does not connect to an emergency response agency. Emergency calls should be directed to local 911 response centers. 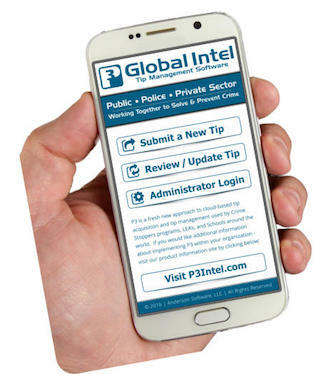 Tipsters can anonymously submit information to the call center with the P3 Tips mobile app. The mobile app also allows for secure 2-way communication with the TCCS coordinator. It has become the most popular way of submitting Crime Stoppers tips! Download the P3 Tips Mobile App today. Tipsters have the option of submitting their tips online from this website. Like the phone and mobile app, the process is completely secure and anonymous. The online tip form is a very effective means of safely communicating with TCCS. You will also find a "Submit a Tip" button in the left sidebar of our Facebook page. It is the only secure and anonymous way to submit a tip via Facebook. At the time of the initial tip, a Tip ID & Password will be provided to the tipster for the purpose of follow-up. This system simplifies the process if the tipster needs to recontact TCCS to convey additional information to our coordinator. It also provides a secure means for the coordinator to ask questions or provide reward information back to the tipster. The tipster remains anonymous throughout this process. Taos County Crime Stoppers will not pay a reward unless the tip is submitted exclusively through one of our 3 anonymous methods: Telephone Tipline, P3 Tips Mobile App or our WebTip Submission Form accessible on our website and Facebook page. Tipsters are not eligible to receive a reward if their information is submitted after a criminal offense is solved or if a fugitive is already in custody. Taos County Crime Stoppers pays rewards only for anonymous tips. Tipsters who identify themselves or provide tips through channels outside of the Crime Stoppers program are not eligible to receive payment.